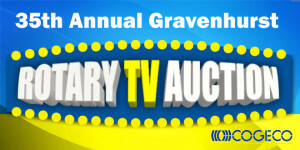 Welcome to the 35th edition of our Gravenhurst Rotary TV Auction. Times have certainly changed in those 35 years. 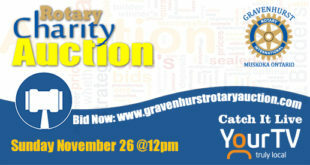 Technology is changing as we speak and allows us to make many improvements in the way we deliver the auction to you. 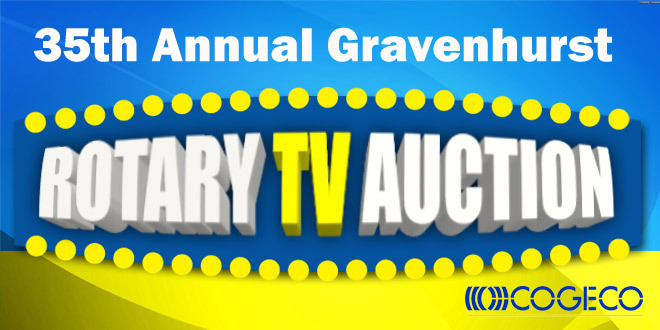 Our TV Auction has now become a TV / Internet Auction and many of you will place your bids without even turning on a TV set. One fact, however, does remain constant. That fact is that the needs in our community and our world are as great as ever and the fifty four members of our local Rotary Club are working hard to meet those needs on a daily basis. This is where you come in. We would not be able to meet those needs if it weren’t for the support of our local businesses and the fine citizens of this community. Gravenhurst has always had a reputation of being a very generous town and, once again this year, this has been demonstrated by the donations from the business community and various individuals in town. This year’s Rotary International theme is “ Be A Gift to the World “. We give gifts at various times during the year. Birthdays, anniversaries, Christmas, and other special days throughout the year are celebrated with gifts. The giver freely gives. The receiver doesn’t earn them. They are gifts. Some gifts are practical. Most gifts are thoughtful. They are given out of love . I like to think that we, in Rotary, like many others, are in the gift – giving business. Over the years, local organizations like the Guides, Scouts, Minor Hockey, Special Olympics, Skating Clubs, and others have benefitted from our generosity. Elementary schools have received chess sets, sports equipment, band instruments and financial support for cultural events and breakfast and lunch programs. We have sent some high school students to other countries on exchange and others to conferences all across Ontario. Internationally, local Rotarians have helped build schools in Cambodia and given away thousands of bicycles to allow Cambodian children the opportunity to go to school. 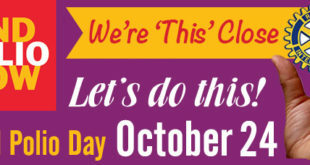 As an organization, we are still working hard to eradicate polio. 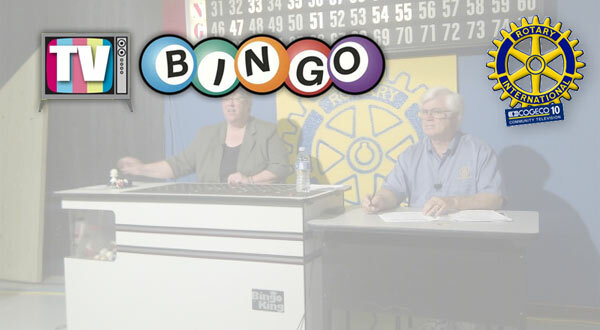 I am a member of the Penticton Okanagan Rotary Club (breakfast club). I read in this weekend edition of the Globe and Mail about your club’s Rotary Bursary Endowment Fund and wanted to know what projects you had/have to generate income for this fund. While there have been some fundraisers for the project like a classy mayor’s ball and such the bulk of the funds have come from members of the community that want to leave a legacy for their families by donating large sums or investment portfolios and even taken out wills to help fund the project. We then have bursaries in the names of those families.